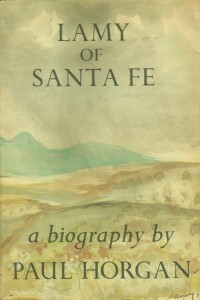 Lamy of Santa Fe is the biography of Jean Baptiste Lamy, the first Archbishop of Santa Fe and the inspiration for the protagonist of Willa Cather’s seminal novel Death Comes for the Archbishop. Coming from humble circumstances in rural Auvergne, France, he became a missionary priest in Ohio before receiving the call to take charge of the Church in New Mexico as Vicar Apostolic. Arriving with his long-term friend from seminary, Machebeuf, he found himself with few priests, most of them unworthy of the office and either elderly or living in scandal. Not to mention the fact that they all maintained that they were still part of the Diocese of Durango in Mexico. From this rocky start, Lamy not only established lasting foundations for the Church in New Mexico, but also Arizona, Colorado, and the area around El Paso, Texas. Winner of the Pulitzer Prize for History in 1975, the book is dense but masterfully written with a gripping plot that belies its weightiness. A priest dying during mass from a poisoned chalice meant for another is just one episode of Lamy’s exciting, if exhausting life described in the book, and it’s amazing just how isolated and hard to get to New Mexico was until late in the 19th century. That he was able to accomplish so much, is remarkable. Highly recommended for those interesting the the history of the American Southwest, the American Catholic Church, and especially those who enjoyed Death Comes for the Archbishop.